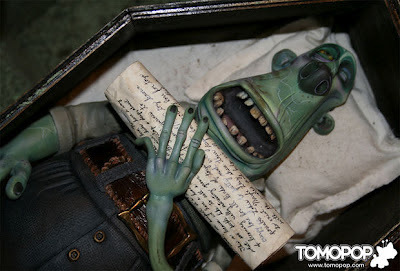 Have I mentioned how much I'm looking forward to ParaNorman? That would be a lot. The movie opens August 17, which can't come soon enough as far as I'm concerned. Why should you be excited? Well, besides the whole stop-motion coming-of-age zombie flick, there's this. Yes, that's a bit of promotional swag sent to one lucky toy reviewer. Marketing much? By the way, if anybody at St. Martin's happens to be reading this and you want to do a similarly-themed Portlandtown promotion tie-in toy, I'm fine with that. Really, REALLY fine with that.